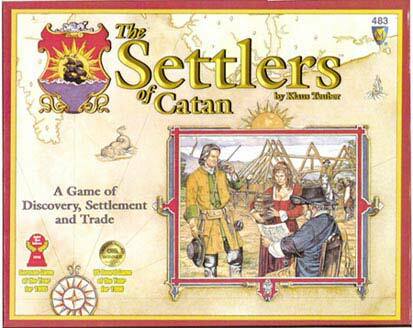 Afterwards, we played Settlers of Catan. I think SoC is my favorite board game, and it's one that Wendy and Brian really like to play also. I guess they are used to playing with someone who has some house rules and does some things a little differently, while I'm only used to playing by the specific rules mentioned in the rule books. I guess they have also never played any of the non-predefined maps, because this time we played random (which actually shows up in some of the map books) and they were a little surprised. Brian won the first game, and Wendy the second; we played with Seafarers the second game. Wendy and Brian are incredibly competitive, but Brian more so I think. Brian spends a long time trying to figure out the right move, and tries to be tricky about his cards and trading and stuff like that. They were sitting next to each other and often arguing (in a friendly manner) about trades and points and strategies and other things like that. Often poking or pinching each other too. :) Thomas was a lot quieter, but built steadily. Luna and I were also kind of poking at each other, but not so aggressively as Brian and Wendy. Even though Luna played before, with Karen and Sebastian, she'd forgotten all the rules. It wasn't anything bad, except for one time that Brian tried to take one of Wendy's resource cards after using the robber without waiting for her to give it to him. He grabbed a development card instead, which Wendy smacked down on to make sure he couldn't see what she had. But that ended up bending the card pretty badly. Brian gave me a replacement card though, which was nice of him. Otherwise it'd be really easy to spot the card in the development card deck. For the second game, Luna and Brian switched seats so Brian and Wendy couldn't reach each other anymore. Things became a little calmer then; I think it's probably best if they are out of each others reach for these kind of games. After the game though it doesn't matter. They don't hold grudges or anything like that. The second game ended after I traded a sheep resource to Wendy, which allowed to her build a city and reach twelve points. In retrospect, it may have been wiser to not trade with her, but I don't think I had that good a chance of winning anyway. The early game had stuck me with very little resources after being cut off by one of Wendy's settlements, and I needed longest road or largest army to have a chance, but Thomas was far ahead of me in road length and Wendy had like six soldiers out. Anyway, we ended around 3am, and they left shortly afterwards. Luna had a really good time. Better than she thought she was going to, and she wants to play again sometime soon. It'll probably be a while before we play again though. Alla is coming back for the Labor Day weekend so we're going to meet up with her then. Maybe the weekend after.